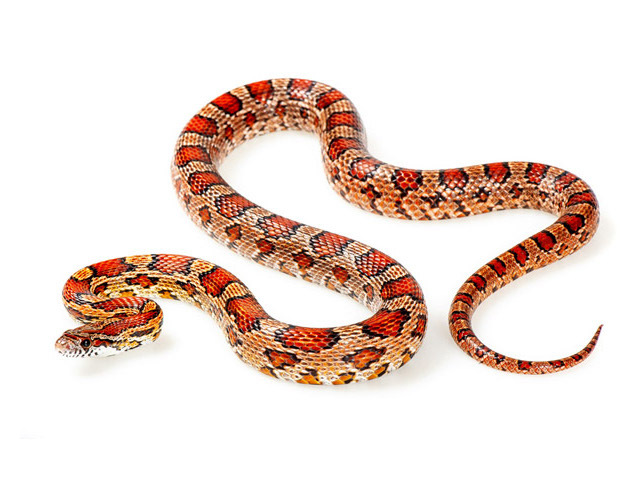 Corn snakes are slender and are usually orange or brownish-yellow, with large, black-edged red blotches down the middle of the back. On the belly are alternating rows of black and white marks, resembling a checkerboard pattern. Considerable variation occurs in the coloration and patterns of individual snakes, depending on the age of the snake and the region of the country in which it is found. Hatchlings lack much of the bright coloration found on adults. Hatchling Pantherophis guttatus are usually started in an escape-proof, plastic container such as a clear shoebox. It is important that they have places to hide and feel secure since most baby Pantherophis guttatus in the wild are eaten before they reach adulthood. Babies that don’t try to hide were removed from the gene pool a long time ago. Adults require a minimum of a 20-gallon long aquarium size (0.3 x 0.7 meters (12 x 30 inches)) – but bigger is better. All snakes are escape artists! It is very important to provide a secure cage, and to remember to tightly close it. Locks are important if there are children or others in the household who may forget to close it responsibly after each opening. Be sure to provide two identical hides – one warm, and one cool. Two choices insure that your pet will not choose the best hiding spot instead of the proper temperature. Most breeders prefer shredded aspen bedding. It is very soft and absorbent, and not likely to cause injury if a small amount is ingested. Juvenile Pantherophis guttatus love to burrow in it and seem to gain a sense of security hiding beneath it. Your Pantherophis guttatus does not require light 24 hours a day and can suffer from stress if the light exposure is too long. It is recommended to keep your Pantherophis guttatus in a natural light pattern that mimics normal daytime with 12hour cycle on/off. Well-established Pantherophis guttatus can withstand chilly temperatures of 10 °C (50 °F), or even less, when brumating without food or during shipping. But active, feeding corns should have a warm spot of the 30 °C (85°F) available to help digest food. It doesn’t matter if the warm spot is provided by a basking light (turn it off at night to provide day and night intervals) or an under-tank heating pad. The important thing is to use a thermometer to measure the temperature INSIDE the warm hide box – not on the glass sides of the cage! A thermometer with a probe will allow you to check the temperature where the snake actually spends its time. It is not important to check 24 / 7. New set-ups should be checked frequently – perhaps a couple of times per day. Once well established, checking at different times of the day once per week should be sufficient. The rest of the cage can be normal room temperature – usually around 24°C (75 °F). Pantherophis guttatus should always have access to fresh, clean water, this should be changed daily or whenever it becomes dirty, whichever comes first. I never measure humidity. The best way to know if the humidity is proper is to wait for the snake to shed. It is best to add a little damp moss in the hide box when its eyes go ‘blue’ a week or more before shedding. If the snake sheds in one piece, the humidity level is fine. If the shed is in many pieces, or sticks to the snake, it is too dry. As long as there is no sign of mold or fungus in the cage, it is probably not too wet. Remove the damp moss between sheds and let it dry. You can reuse it for the next shed, or replace it. Mice and other rodents of the appropriate size are the most common food items. Most babies will eat newborn ‘pinkie’ mice. If they won’t accept frozen / thawed pinks within a few weeks, it may be necessary to start hatchlings on live pinkies. They usually switch easily after a few live meals as they begin to recognize food by smell. Bigger Pantherophis guttatus often love chicks and other birds as well as rodents, and rarely refuse frozen, well- thawed items. A good feeding schedule may be every 5 – 7 days for babies and yearlings, to once per 7 – 10 days for adults. The food item for new pets should barely make the snake’s belly bulge to avoid stress-related regurgitation. Once well-established, the food item should make a definite but not huge bulge after it has been consumed. It is important to realize that a new acquisition is under a lot of stress adjusting to its new home. Handling is an added stress that is better left to a well-adjusted snake. Try to handle baby snakes as little as possible the first few weeks. Only later slowly increase handling to short but frequent handling sessions. Remember that babies assume you are a giant predator, and that they will react accordingly. Don’t be surprised when they behave defensively or try to hide. As they grow, they have fewer natural predators and less reason to hide. With gentle and consistent handling, most Pantherophis guttatus will grow up as gentle as any cat or dog. But patience is just as much a virtue in baby snake training as in puppy or kitten training. Most adult Pantherophis guttatus don’t mind being handled for a few hours per day once they are used to it. Try to avoid handling during the week or two prior to shedding because some snakes are more nervous at that time, plus it is also possible to tear the skin prematurely. Aspen bedding is very easy to spot-clean because the moisture and feces tend to stay in one spot. You can pick out the dirty spots a few days after feeding, and replace the entire bedding when it appears or smells dirty. Timing will depend on the size of the cage, snake, frequency of feeding, etc. As a general rule, corns are less messy than king snakes, and Pantherophis guttatus feces tend to be a little drier and seldom smeared over the whole cage. As mentioned in Humidity section, it is best to add a little damp moss in the hide box when its eyes go ‘blue’ a week or more before shedding. If the snake sheds in one piece, the humidity level is fine. If the shed is in many pieces, or sticks to the snake, it is too dry. Digestion problems are the most common symptoms of stress in Pantherophis guttatus. If a snake is stressed by incorrect temperatures, handling, shedding, cagemates, incorrect husbandry, or any other stressor, it is likely to either refuse food or to regurgitate before digestion is complete. Regurgitation is very serious, and repeated episodes can lead to death. Thus, it is important to avoid feeding after regurgitation until you have read the “regurge protocol”, available here.